ANA Mileage Club is one of the most valuable frequent flyer programs in the world. Aside from the fact that this is a great airline with an excellent award redemption chart and exceptional service in all cabins, ANA is also a Star Alliance member and transfer partner with the Amex Membership Rewards and Starwood Preferred Guest programs. ANA also had their own set of 11 partner airlines, and several subsidiaries called ANA Group. Flying on Star Alliance airlines and ANA group airlines earns status miles. ANA has an unusual complimentary upgrade scheme. 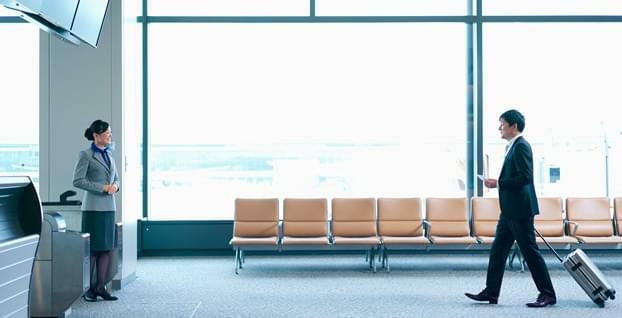 You can upgrade your flights using so-called upgrade points that are awarded based on the number of premium points earned on ANA Group flights only in the preceding year. 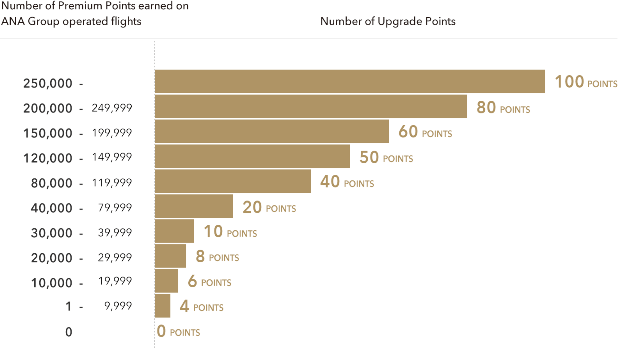 For example, if you earn up to 10,000 premium points, that gives you four upgrade points, 20,000-29,000 – eight points, 40,000-79,999 – 20 upgrade points, etc. Additional Baggage Allowance: Bronze and above: One bag or 44 lbs (Bronze only on international flights). Free Valet Parking: Platinum and Diamond at Narita Int’l Airport. Waived International Flight Service Charges: Diamonds. Free Premium Economy seat: Platinum and Diamonds. Priority Seat Reservations for ANA Japan Domestic Flights. Frequent Visitor e-channels at Hong Kong Int’l Airport. Early Reservations for ANA Domestic Flights. Priority check-in at the ANA Premium and Business Class counters. Priority parking reservations at Haneda Airport. Priority check-in at the First Class counters. Exclusive Name and Baggage Tags for members with over 150,000 Premium Points. Bronze: Pay with miles or Upgrade Points. Platinum and Diamond: ANA Lounge, Star Business Lounges worldwide. Diamond: ANA Suite Lounge, Star First Lounges worldwide. Select from seven Exclusive Benefits (60,000 ANA SKY COINs, six Suite Lounge vouchers, two restaurant vouchers, 12 Upgrade Points, etc.). There is no official policy or promotions regarding ANA status match, but there is some anecdotal evidence of the requests being approved sometimes, albeit rarely. In any case, it is very unlikely that ANA would approve a status-matching request from a Star Alliance airline program. You can earn Premium Points by flying on Star Alliance partner airlines and ANA Group airlines.